Hope you all had a nice weekend. Mine was great!! I truly enjoyed spending time with Krista and can't wait 'til we get to hang out again! My post for today is for Taylor's Cupcake Sketch Challenge and of course it's late LOL! It usually ends on Monday but this one ended yesterday.....I really thought I was ahead of the game!!! Oh well, at least I completed the challenge right?!! I love this sketch and those cute cupcakes.....the colors are yummy too! They're very bright and happy.....I'm happy because this dsp is almost gone!!!!! I'm going to try and finish another challenge this morning before taking my son back to the Oral Surgeon this afternoon! Hopefully this will be our last trip and he'll be healing up soon!! I hope you all have a productive day as well! Thanks so much for stopping by and have a great rest of the day!! WOW! Love the bright colors...you really nailed this sketch! Nice Job! Oh, I love the happy colors of this card, so cheery! This is adorable. Love the sketch and the colors you chose. so cute and bright and cheerful! just what i needed to see today :) thanks for sharing! So cute! I love how you matched up the colors with the DP. Perfect! WOW! You totally aced that layout! Love those colors. It's so spring-y. Fantastic! Oh how yummy!!! What a fab creation!! TFS! so cute and such fun colors!! 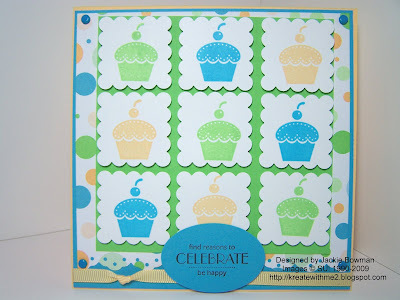 Now this is a cute card Jackie the colors just make you smile and who doesn't like cupcakes? Another beautiful card Jackie. You are right - just looking at the card makes you happy. Almost good enough to eat. This is very bright and cheery. I like that dotted paper with the images. Cute card, Jackie! Great take on the sketch! Beautiful job on the sketch!! Yummy colors and cupcakes!! Very cheery!! Ooooh, I love that sketch, Jackie, and the cupcakes are adorable!!! Love the pretty colors, too!!! Hope all goes well for your DS today!!! What a cool idea - great job! Cute, cute, cute. Love the DP and the colors, Jackie. Another great card! This card is too cute. Everything just works so well together. Such a funny card, the bright colors looks great! Loving the bright and fun colors! So sweet and cute!